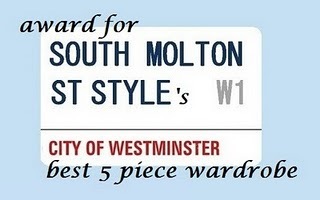 Thank you so much to everyone who voted on our very first South Molton St Style Award for the blogger with the best 5 piece capsule wardrobe. We gave 6 contestants the chance to win, after a mammoth initial response. In the end, there was a clear winner - Charlotte at onlysayingwhatyourethinking with the highest number of comments. Charlotte is therefore crowner a South Molton St Style Award Queen, proving that new mummies can certainly be yummies. She will be receiving some great goodies we have picked up on our blogging travels. Congratulations Char! Congratulations to the winner! She looks lovely. Answering your question about illustrations on my blog - unfortunately, I'm not that good, so I picked some of my favourite ones by Cassandra Rhodin. I left a copyright note on the bottom of the page with her name and original source, so I hope they aren't going to shoot me for using the images.